Last Christmas I wrote about our native mistletoe and observed that mistletoes were represented in many different families worldwide. By contrast there are 500 hollies which are all classified in an ancient genus called Ilex which is the sole member of the family Aquifoliaceae. On a worldwide evolutionary time scale the genus Ilex is thought to have evolved and survived in wet zones called laurel forest. Such areas are typified by semi tropical cloud forest and characterised by regular rainfall, heavy mists and dews. Many different genera of evergreen plants have evolved in such conditions and their leaves very efficiently shed water. Parallel evolutionary strategies have led to hard, waxy, glossy, slightly elongated, sometimes hanging leaves. Holly is a prime example of leaves with a pointed drip tip that directs water to the ground. I had no sooner penned the above and Peter came around. In my first draft I had stated that constantly wet leaves have trouble with transpiration, Wiki had just told me! He quickly debunked this notion and went on to explain that thick shiny leaves are much more significant for survival in dry dehydrating winds and added that holly was frequently found in cold windy exposed situations. My final protestation was to ask about the drip tip? He suggested that rather than remove excessive water it was perhaps more important to conserve water from misty-wet leaves by directing it to the roots! 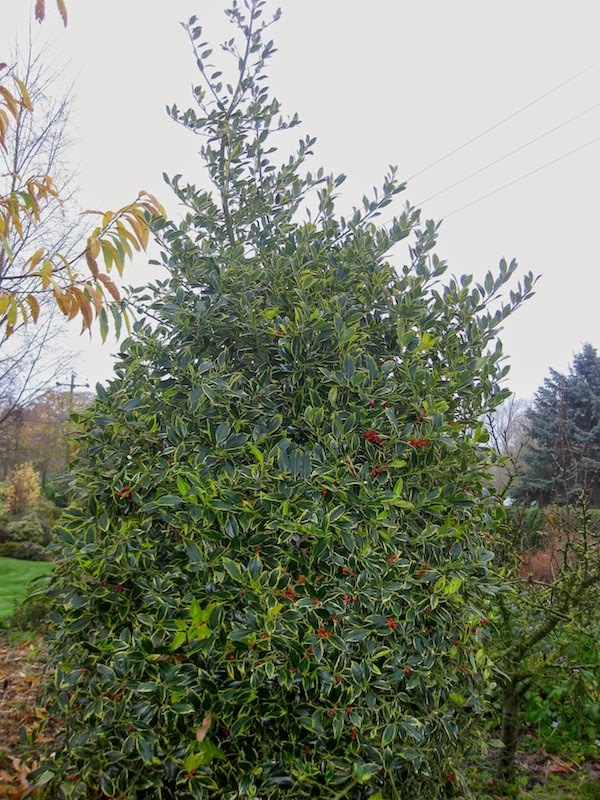 The European Holly Ilex aquifolium is one of our few genuinely native evergreen hardwood trees. It has a long history entwined in ancient pagan traditions and land usage. It was used as animal fodder and is highly nutritious. It was extensively planted for hedging and an old country saying is that the best place for lambing is under its cover. The siting of 200 year old hollies even now is taken as evidence of old boundaries. Ilex aquifolium ferox is rather prickly! You may protest that hollies are rather prickly for eating! Holly when browsed is spinescent. That is prickly new growth is promoted when leaves are eaten. Holly, free of poisonous berries, were cropped high on the bush where the leaves are smooth. There is some evidence that shoots several weeks old are preferred by farm animals. Indeed, deer and New Forest ponies have been observed to gnaw away small branches, let them fall to the ground and some weeks later to return to eat them. When I pruned Cathi’s holly and fed branches to her Soay sheep they came running and had a quick nibble before turning away as they do when they sample any new food. Now a month later those branches have been gnawed almost completely away. Yesterday I gave them some more of the original prunings and they eagerly started to eat them. Were they now confident that the the food was safe? And do animals find ‘weathered’ shoots taste better, perhaps sensing that natural toxins have broken down? Holly once was even planted as coppice as an ongoing crop. Many English country place-names with derivations of ‘hollins’ record an ancient farming history. I must tell you I am addicted to variegated plants and none of my seven hollies are green. I grow them as specimen shrubs in a more or less natural shape. I am generally quite scathing of folk who topiarise their shrubs by clipping them tightly! I came very close to this myself on one of my hollies recently when I got a little carried away with my petrol hedge trimmer. Actually it looks rather nice loosely clipped! Hollies make the best hedges off all, as witnessed in old farm fields. Evergreen, variegated, (if you like that sort of thing), wind proof, hardy, long lived, impenetrable, tolerant of full sun or very deep shade, easy to grow - what more do you need? Unfortunately small plants are very vulnerable to rabbits who just love it. I found this to my cost when I planted my new garden and with surgical precision they cut my new plants to the ground. Brenda contrived little bamboo cages around their replacements! Now that my hollies are large and unprotected they suffer no damage at all. Holly’s main disadvantage as a hedge is that it is slow to establish. Variegated ones are painfully slow! This is the downside of their tolerance of deep shade. My advice is that if you are planting a holly hedge, to plant large container grown plants, economising a little by planting them perhaps at a fairly wide 45cm apart. Ironically, after several years, well established hollies actually grow very strongly as I know to my cost having just pruned some unwanted branches from Cathi’s tree. Most hollies have single sexed flowers. To get berries you need separate male and a female plants - unless you choose a hermaphrodite cultivar such as Ilex ‘Van Tol'. With seven hollies in my garden I have no problems with cross pollination although a male plant such as Ilex ‘Silver Queen’ is unable to berry! No, this is not a misprint, ‘Silver Queen’ is a male - and ‘Golden King’ is a female! Such confusion is common! What a shame breeders and botanists fail to talk! I grow the silver and golden variegated forms of the more commonly green ‘Van Tol’. These clones are hermaphrodite and are not very spiny. Green hollies sow themselves freely and do so in shady places in my Worsbrough cemetery garden where their hard shiny leaves efficiently shed my glyphosate spray. If you are one of my very rare visitors please help yourself! I had a holly tree in Bolton Percy which like the picture below had shoots close to the ground. I had contrived next to it a bed of raised soil. (These things happen). The wind blown branches abraded by the soil within eighteen months had rooted. A novel form of layering which illustrates their ease of rooting. Peter’s pendulous holly has needed a little help with careful pruning. You can just make out lower shoots on the ground. I wonder if they will root? (I don’t think he will leave them). 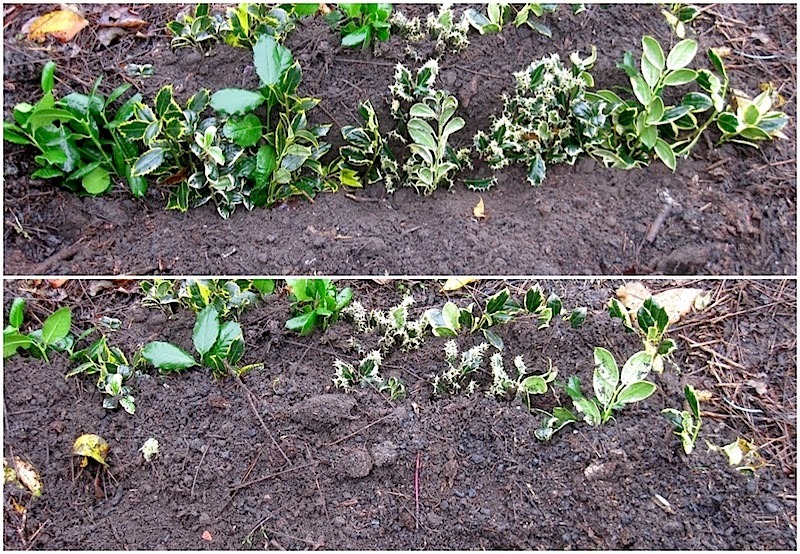 Inspired by reading how easy they are to root I tried this November inserting some holly cuttings direct in the ground. Observe how I have wounded them by deliberately slicing. As is my wont, other than any leaves sliced away, all the leaves are intact. I have no idea how well the cuttings will root! Some of you will remember how I inserted many diverse hardwood cuttings two years ago and six months later reported their progress. I will again report my future success or failure! Hedges are clipped and shrubs too can be lightly pruned with a hedge trimmer. Better for specimen shrubs and small trees to tastefully prune in a natural way using secateurs and loppers. Or as in the earlier picture a saw! This Ilex ‘Van Tol’ was blown horizontal on the village plot several years ago. Still attached to the ground, it threw up a complete line of strong new trunks. With the aid of Peter’s chain saw we now have a very fine single trunked tree. Note all the new growth was wonderfully vigorous - in contrast to my earlier comment about hollies after planting being so very slow. Shame on me. My Golden King has reverted green. Unusually for reverting, the growth in this case comes from below the ground. (Such growth on shrubs is usually a rootstock suckering but my holly was not grafted). See the reverted yellow shoot. Where variegated hollies are foolishly cut back very hard to the trunk the new shoots usually revert to yellow and lack chlorophyll. Such a tree will die. If you are feeling Christmassy you might like to read about mistletoe and ivy. If all those cuttings grow you'll be able to have a roadside stall. It's ages a once I saw a most.e thrush - gorgeous birds. Glad you are back Sue, I thought you had deserted me! The cuttings are just a bit of fun,it only took half an hour to take them (and perhaps an hour to take the pictures!). I don't even want any more hollies and you will have noticed I have even included the reverted ones - perhaps these green ones will root the best? 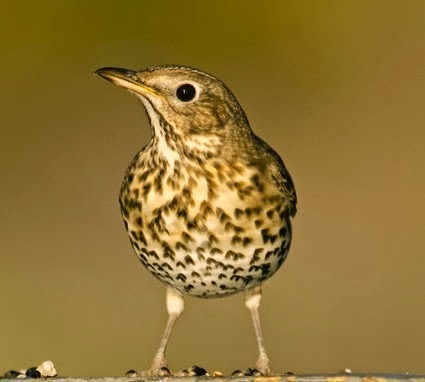 The mistle thrush of course came from Cathi! As if I'd do that! Roger, I am always amazed by your encyclopaedic knowledge! Whenever you explain anything, you go into it in great detail, which is a refreshing change. One of the things I dislike about magazines (pretty much ALL magazines) is that they seem to be written very superficially, for idiots with a very short attention-span. I certainly didn't know or expect that animals would like older Holly trimmings rather than fresh ones. Perhaps to them this is the equivalent of us humans hanging game to let it mature? I just love your concluding analogy Mark! Very interesting reading. In our area though, holly, laurel and other Ilex seem to be temperamental in areas of wind. It must have much to do with soil conditions if they are supposed to live well in dry, windy areas. My grower does not even plant certain varieties because he knows they will not survive. Interesting Donna about not doing well for you. Your comment seems to ring a bell that I have been told this before about your part of the world - oh yes It was Alain I remember he e mailed me as his computer was playing up and he could not get on blogger! Very informative. Don't you hate it when people come along and tell you that some impressive-sounding fact you just read is wrong? Especially when you are aware that the other person knows more than you do. I have no hollies in my garden. I would very much like to have the native I. verticillata. We are talking to the neighbors about redoing the hedge, maybe I can get some incorporated. It's happened to me again Jason! Last night we dined out with friends and the table decoration included Ruscus, the genus of Butchers Broom Ruscus aculuteus which is rather like holly but much more prickly! I announced it used to be used by butchers to tenderise meat. I WAS SHOUTED DOWN! Net searches proved them right, although I did find one reference in a novel! If any butchers read this, please let me know if I have any hope of regaining any credibility! Interesting in-depth post Roger, I only have a bush of Ilex aquifolium ‘Gold Flash’ and a large Common Holly (30+ feet) which, aided by the birds, is responsible for dozens of seedlings which appear every year usually in the most inaccessible parts of the garden, under trees and shrubs, unfortunately these have no problem growing on even in the driest most shaded conditions. They are wonderfully adapted to dry shade - unfortunately. They get quite big in the middle of other shrubs at Worsbrough and are getting on top of me! Any update on e the holly cutting faired yet Roger? I am planing an update soon. 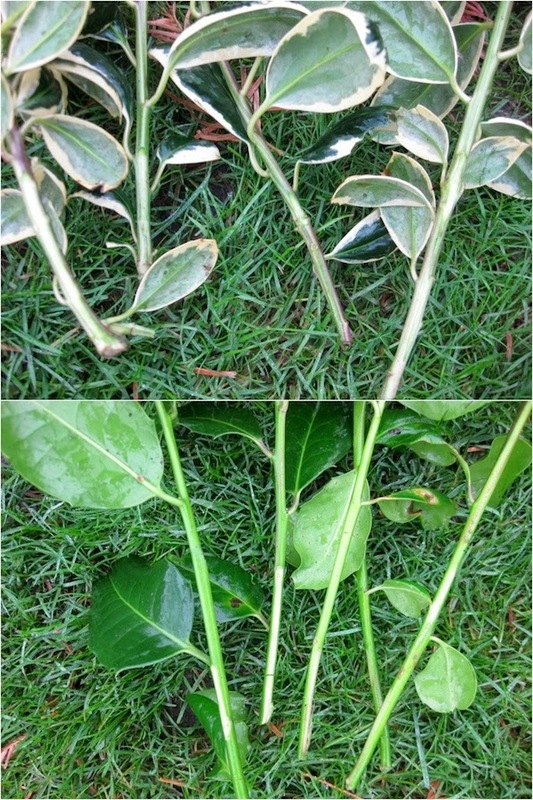 The cuttings have had complete neglect other than weed control. They are currently overrun by the remains of the courgettes!